We Answer 5 Common Questions People Have About Social Media Marketing | V2M2 Group, Inc.
Like brushing our teeth or brewing a morning cup of coffee, checking in on what’s happening within our social networks has become part of the daily routine for most of us. In fact, 30% of all time spent online is on social networks, according to GlobalWebIndex (GWI). As a result, social media has also become a routine marketing tactic for nearly every business, helping brands build awareness, share and interact with customers and prospects, and create another vital touch point in the changing customer journey. But as the social media landscape continues to evolve, both green and seasoned marketing professionals are constantly searching for answers on how they can best leverage social media within their organizations’ marketing strategies. To lend a helping hand, TopRank Marketing’s SEO team took a peek at social media marketing related keywords and keyword groups, as well as related SERPs and our own data, to identify some of the top questions people are asking around social media marketing. And today, we answer those questions. #1 – What is the impact of social media marketing on business? Like any marketing tactic, brands and marketers want to understand the business case and benefits of social media marketing. After all, social media marketing takes time, resources and strategy to be successful—so you want to make sure you’re aligning your efforts with your business needs and goals. Increases exposure and brand awareness. Social media platforms provide your business with another online space to share and engage with your audience—outside your website or brick and mortar store, and in a place customers and prospects feel comfortable. Through both organic and paid social activities, the content you share and the discussions you host can help keep your brand top of mind or get it on new customers’ radar. Builds brand loyalty. The content, discussion and service you’re providing on your social media platforms can help build an engaged band of loyal followers. Provides useful audience and market insights. Social media allows you to see your customers—and competitors—in their true habitat. With just a few clicks you can learn more about the people they interact with, the types of content they share and engage with most, their favorite TV shows, and the list goes on. Generates leads and sales. While social media is not traditionally viewed as a conversion platform, those that build awareness, trust, loyalty, and engagement with their audiences can absolutely drive leads and sales. Furthermore, marketers can go beyond social media marketing to social media prospecting. Simply put, your social media marketing strategy is your roadmap for why, who and how your social media efforts will help you achieve your business objectives. Without a strategy in place, you’re just posting and hoping something sticks. With a strategy in place, you’re able to plan, execute and measure the effectiveness of your tactics, and use that information to refine and drive your efforts forward. #3 – How do I create a social media marketing strategy? The key to crafting a social media marketing strategy is striking a balance between the needs of your audience and the goals of the business. TopRank Marketing believes an integrated approach to digital marketing is key for success, so begin by asking yourself: How will my social media strategy fit within my overall digital marketing strategy? Identify who your audience is and what they’re pain points are. Choose your content mix based on the types of content your audience likes to consume on social. Define what you want your followers to know about your brand. Outline how often you’ll engage on each channel. Determine how you’ll measure effectiveness or results. #4 – What are some of the top social media management tools? Tools make reaching social media marketing goals possible. Whether you’re a one-person startup or a multinational enterprise, it’s nearly impossible to manage your social media marketing program without using third-party tools. #5 – What future social media marketing trends are on the horizon? 1. The continuous climb of video. Humans are visual creatures by nature, and video has taken over social media news feeds. When executed well, video is a powerful marketing tool that can help brands capture audience attention, show value and encourage engagement. 2. The “pay to play” requirement. With nearly every brand using social—as well as frequent tweaks to platform algorithms—the competition to stand out in news feeds has never been more fierce, with brands fighting for visibility and engagement. As a result, more are paying to play these days by investing in social advertising to drive awareness and engagement, as well as sales and other conversions—and this trend will definitely continue. 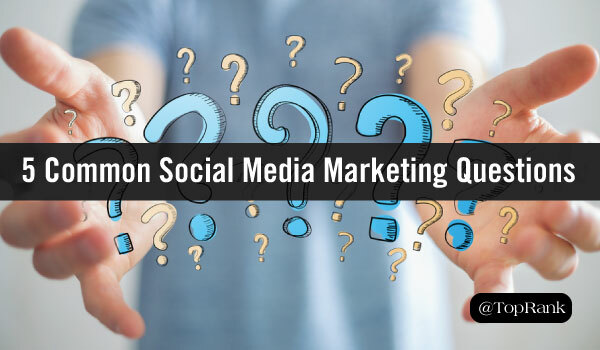 What questions do you have about social media marketing? Ask them in the comments section below.